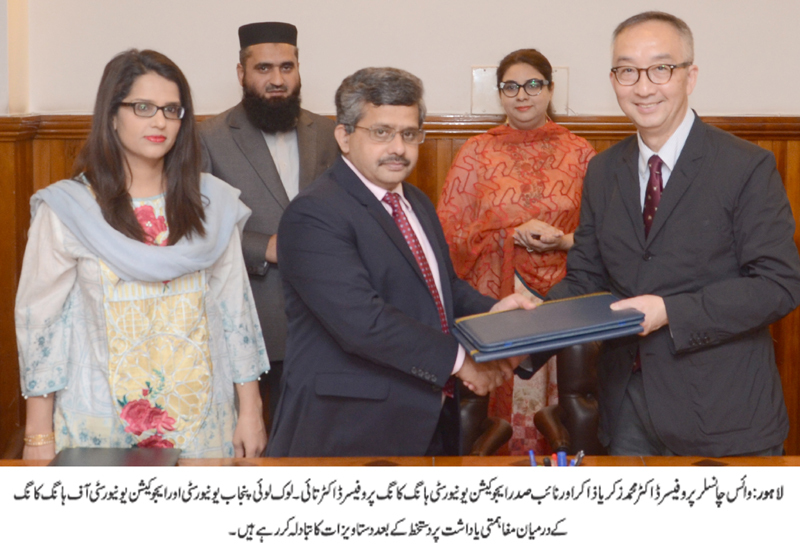 LAHORE: (Monday, March 19, 2018): Punjab University and the Education University of Hong Kong have signed a memorandum of understanding to foster friendly cooperation and to promote academic collaboration. In this regard, an MoU signing ceremony was held at VC office here on Monday. PU VC Prof Dr Muhammad Zakria Zakar, Vice President the Education University of Hong Kong Prof Dr Tai-Lok Lui, Dean Faculty of Education Prof Dr Mumtaz Akhter, Director IER Prof Dr Rafaqat Ali Akbar, Director External Linkages Dr Fouzia Hadi Ali and others were present on the occasion. As per MoU, both the partners would launch joint research activities and would exchange faculty members, research personnel, students and staff. Both the universities would also exchange academic and other publication and organize joint conferences, seminars and meetings. Addressing the meeting, PU VC Dr Zakria Zakar said that it was need of the hour to promote linkages among the academic institutions of the two countries and enhance people to people contacts.